Two heroes form a reluctant team against an evil foe. A third warrior appears, bringing the epic DC Comics trinity to the big screen. Our heroes face a formidable villain in the Dawn of Justice Trinity vs. Lex Luthor Button Set. 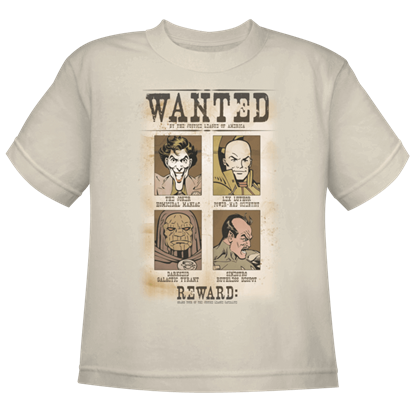 Displaying the faces of pure villainy in a design which resembles the appearance of a wanted poster from the Wild West, the Kids DC's Most Wanted T-Shirt is a terrific addition to the wardrobe of any child who loves comics.